It’s pretty astounding that the average American creates over one and a half tons of trash a year. Very overwhelming if you think about it. Spread that figure out over 300 or so million Americans and you get an inkling of the problem we’re facing—we’re making more trash as a nation than we know what to do with. No doubt recycling is catching on and becoming a habit for many of us—I’m thankful for that—but there’s still a majority out there who don’t recycle…and that’s a problem. We have the huge challenge of encouraging people to see the necessity of recycling and then to make a commitment to do it. One option may be just to pay them for their recyclables. Hey, don’t laugh yet…it’s not as far-fetched as it sounds. If you look at the growing demand from worldwide burgeoning economies such as China and India, you’ll see that raw materials are more in demand than ever. Items such as plastics and aluminum are at their all time highs, which sets up a huge market need and big-time incentive for companies to pay cash for trash. I know at my company, American Waste Control, we have a program now in place where we actually pay non-profits and groups per container for their recyclables. 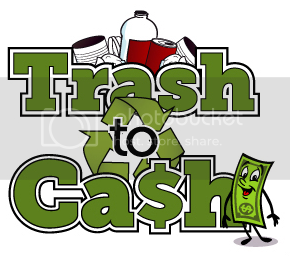 We call it our Trash to Cash Program and many schools and organizations in Tulsa are finding it a great way to earn money for their special projects. The incentive is pretty worthwhile: Not only are they doing something incredible for the environment, they’re also helping raise funds to further their organization’s cause. We’re not at a point as a company where we can pay households for their recyclables, but I can see a time when that could become reality for us and other recycling haulers. Going green could actually net some green. Pretty ironic given that a decade ago, recycling was considered a zero profit endeavor. Now, recyclers are finding a niche market, and bringing others along for the ride.